Patchwork is a hands on workshop for learning Git and GitHub. There will be snacks for hackin', lots to learn, and new friends to be made. We'll have GitHub staff and other open source mentors to lend a hand as attendees make their way through the workshop. Patchwork night is great for people new to Git and GitHub. By the end of the night you'll have created your first open source project, merged a pull request, and will have green squares on your contribution graph! If you want to help mentor future open sourcers, this night is for you, too. You and GitHub staff members will help attendees with questions throughout the workshop. @jlord will give a talk on becoming an engineer and a community member will complete the evening with a lightning talk on an open source project. @mattyoho, @rachelmyers, @bleikamp, @chrissiebrodigan, @paulcbetts and other Hubbers and mentors will all be on hand to answer your queries! Also, no coding experience required! RSVP now. 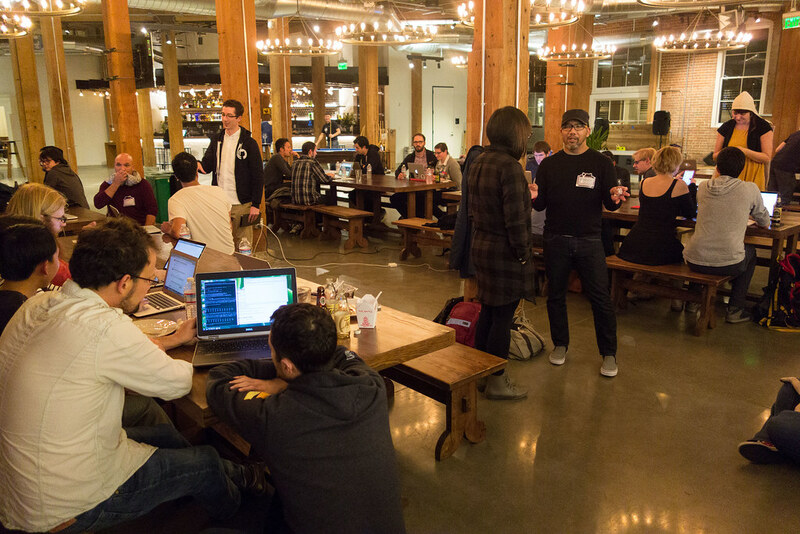 Patchwork is a community event intended for networking and collaboration in the tech community. We value the participation of each member and want all attendees to have an enjoyable and fulfilling experience. Accordingly, all attendees are expected to show respect and courtesy to other attendees throughout all events hosted in the GitHub space. To make clear what is expected, all delegates/attendees, speakers, exhibitors, organizers and volunteers at any GitHub event are required to conform to the following Code of Conduct. Organizers will enforce this code throughout the event. GitHub is dedicated to providing a harassment-free event experience for everyone, regardless of gender, sexual orientation, disability, physical appearance, body size, race, or religion. We do not tolerate harassment of event participants in any form. All communication should be appropriate for a professional audience including people of many different backgrounds. Sexual language and imagery is not appropriate for any presentation given in the GitHub space. Be kind to others. Do not insult or put down other attendees. Behave professionally. Remember that harassment and sexist, racist, or exclusionary jokes are not appropriate at this event. Attendees violating these rules will be asked to leave the event at the sole discretion of the event managers. Thank you for helping to make this a welcoming, friendly space for all. Be careful in the words that you choose. Remember that sexist, racist, and other exclusionary jokes can be offensive to those around you. Offensive jokes are not appropriate and will not be tolerated under any circumstance at this event. If a participant engages in behavior that violates this code of conduct, the event organizers may take any action they deem appropriate, including warning the offender or expulsion from the event or conference with no refund. If you are being harassed, notice that someone else is being harassed, or have any other concerns, please contact the organizer, Jessica Lord, another GitHub employee or a security officer. GitHubbers will be happy to help participants contact security or local law enforcement, provide escorts, or otherwise assist those experiencing harassment to feel safe for the duration of the conference. We value your attendance.